This is the perfect escape for the enthusiastic sea kayaker seeking the pace and feel of a true vacation. This remote section of the Baja coastline is a paddler’s dream, offering unique scenic beauty combined with abundant wildlife viewed from above and below the water’s surface. The Sea of Cortez presents optimal paddling conditions in the fall and spring. Enjoy the warm waters in fall, perfect for extended snorkeling. Spring trips are characterized by warm, calm days and possible encounters with migrating whales. Kayaking along this section of Baja coastline allows us the opportunity to explore a region accessible only by water. This remote roadless area offers isolated beaches, canyons, arroyos filled with palm trees dotted with small fishing villages and ranches. Most of our crew grew up in this area, which adds a unique insight into the local culture as we visit their relatives and learn about the regional history when exploring the seaside ranching and fishing villages of Tembabichi, Nopolo and Los Dolores. Fly to Loreto, Baja, Mexico and transfer to the hotel. The afternoon is yours to explore this tranquil seaside town. Plan to join our group for a pre-trip meeting at 5:00 PM by the swimming pool at Hotel Oasis. Any rental items you requested will be distributed and paid for this evening – cash is appreciated, U.S. dollars are welcome. Enjoy exploring and dinner on your own or with others in the group at one of the many restaurants in town. After breakfast at the hotel, we transfer by van to Puerto Escondido (1/2 hour) and then an approximate two hour boat ride delivers us to our first camp at Ballenita Cove. Get settled with your gear, enjoy a hearty lunch and then we gather for an afternoon kayak orientation and group paddle around the bay. Kayaking excursions from approximately 8-16 miles per day are combined with skiff rides as we move south along the Baja Peninsula Coastline then camp on San Jose and Espiritu Santo Islands by the end of the week. Camps are on isolated beaches along the way at locations such as Ballenita Cove, Puerto Gato, Islas San Jose and Espiritu Santo (where we snorkel with friendly sea lions). Taking a break from paddling and depending on the season, we’ll hike up canyons, go snorkeling to explore the fascinating underwater world of the Sea of Cortez, or jump in a skiff for an occasional morning of fishing. Of course, there’s always the option of relaxing at camp with a good book. Breaks at Tembabichi, Los Burros, Punta Alta or El Pardito give us a chance to visit the friendly Mexican families living on the coast and interpret the rich history of the area from stories passed on from their ancestors who have pearled, farmed, ranched and fished this coast since the 1800’s. After a morning to enjoy our last campsite, some paddling and lunch on the beach, we depart from Espiritu Santo Island and transfer by boat to La Paz (approximately 2.5 hours). Check-in to our hotel, Posada LunaSol, with the afternoon free to shower, relax and take a walk into downtown La Paz before meeting for our farewell dinner at a local restaurant this evening. Please reserve equipment rentals on your trip registration form. Payment will be collected in Loreto prior to your trip departure, cash is required (U.S. dollars are welcome). Single supplements must be prepaid. Rentals requests are organized and packed in La Paz ahead of the trip and brought to Loreto. Therefore, any rentals must be requested in advance – we are not able to provide rental items if they weren’t brought from La Paz. Payment for rental items should be made at the pre-trip meeting on itinerary day 1. Please plan to pay in US dollars. For a pillow, we suggest bringing a small travel pillow or an empty stuff sac that can be filled with clothes. 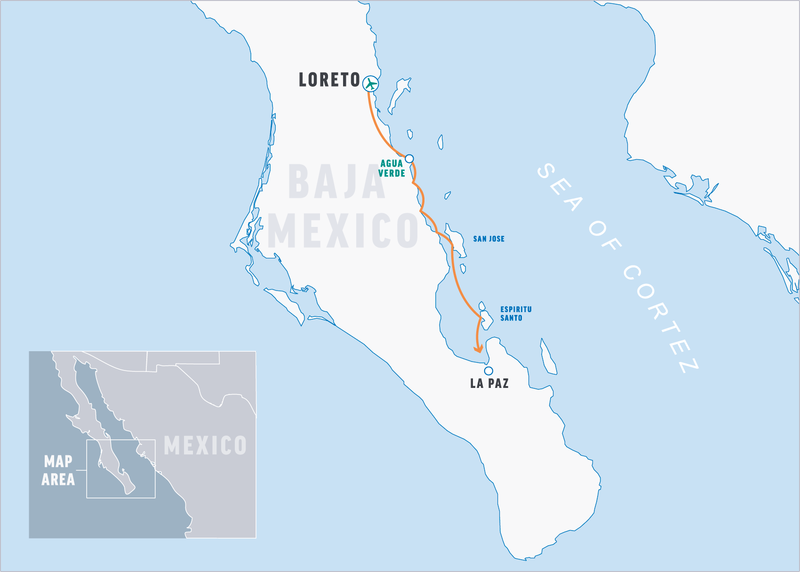 You should make arrangements to arrive in Loreto, Mexico on or before day 1 of your trip. On the evening of day 1, join us for a pre-trip meeting at Hotel Oasis at 5:00 PM. The night is free for you to explore Loreto on your own and dine at one of its many fine restaurants. Alaska Airlines flies to Loreto (LTO) from Los Angeles (LAX). These flights tend to fill fast and depending upon the season may not be offered daily. You may choose to fly roundtrip into La Paz or San Jose del Cabo. From San Jose del Cabo, you can use EcoBaja Tours to get to La Paz (a three hour ride). From La Paz, you can take the Aguila public bus to Loreto to start your trip (a five hour ride). Alternatively, Aereo Calafia may have flights to Loreto from La Paz or the Cabo area. Aeromexico and Volaris serve La Paz with connections through Mexico City. You will overnight in La Paz on the night of day 8, offering you the flexibility to schedule your return transportation for anytime on day 9. After the trip, most our guests fly out of San Jose del Cabo (SJD), taking the three hour Ecobaja Tours shuttle from La Paz. Numerous airlines fly direct between Cabo and North American cities at reasonable rates. Cabo is also referred to as Cabo San Lucas, Los Cabos and San Jose del Cabo (where the airport is actually located). Some of these airlines include Alaska, American, Continental, Frontier, Delta, Virgin America, WestJet, United and US Air. From La Paz (LAP), Aeromexico and Volaris offer departing flights with a connection through Mexico City. Shared Shuttle Service: You can take a shuttle from La Paz to San Jose del Cabo (approximately 3 hours). Ecobaja Tours offers this service. Car Rentals: It is possible to rent a car. Several major car rental agencies are represented in Cabo and La Paz, along with some local ones. Private Shuttle Service: There is also the option of arranging a private shuttle between La Paz and the Cabo airport. Prices are based on the number of passengers. This trip includes accommodation for the nights of day 1 and day 8. If you plan to arrive early or stay late, please contact our office if you would like assistance in booking pre- or post-trip accommodation. Please note: If you decide to fly into San Jose del Cabo, you can stay near the airport or travel to Cabo San Lucas, a resort town at the tip of the Baja Peninsula, approximately 25 miles south of San Jose del Cabo. We camp on gravel and sand beaches along the coast and islands of the Baja Peninsula. A large dome tent is set up by our staff and used for cooking. Meals are taken outside, while enjoying the spectacular views. Chairs are provided, but not dining tables. An additional shade tarp provides protected outdoor seating and relief from the noon day sun. Quality 3 or 4-person tents are provided for double occupancy or you may choose to sleep on the beach under the starry sky. Our staff does the cooking, and you are welcome to lend a hand at any time. It’s a great way to practice your Spanish! We serve a combination of the best of American and Mexican tradition prepared with local fresh ingredients. Barbecued chicken, fresh fish Vera Cruz style, grilled steak tacos accompanied by guacamole and a variety of Mexican salsas, plus fresh soups and salads prepared for lunch are just a few examples of our tasty menu. The skiffs allow us to bring large blocks of ice to store fresh produce and chill canned beverages you bring on the trip. Each evening, we serve a cocktail and appetizer for “happy hour” so you can enjoy the spectacular Baja sunset while sipping an ice cold Margarita! Special diets are easily accommodated due to the variety of foods we are able to store. Our fleet of kayaks on each trip is comprised primarily of double kayaks with at least one single kayak to be used on a shared basis. Most are made by SEDA products of fiberglass construction and all are equipped with rudders. We do have a few rotomolded (plastic) boats in our fleet for variety in seat construction as some of our guests find the plastic boat seats more comfortable. Based upon your experience, size and group composition your guide will help determine what kayak you will paddle, double or single, fiberglass or plastic. We encourage the group to rotate kayaks so everyone has a chance to paddle to their desire. We offer exclusive use of a single kayak on most trips for a fee of $50 per kayak. You must be fit and experienced in kayaking and screened in advance by our office. Due to carrying capacity, the option of exclusive use of a single kayak is limited to a first-come basis. Mexico’s electrical system is the same as in the US and uses the same type of plugs. You will only have access to electricity the night prior to your kayaking adventure. bring a digital camera, don’t forget extra media cards, batteries, etc. Disposable waterproof and panorama cameras are also a fun option. ATM’s are available but can be unreliable. Many shops and restaurants accept US dollars but this can vary depending on where you are. Once in Loreto, you may want some pesos for purchases around town. You can change your dollars into pesos at the airport and banks (closed on weekends and holidays). Please note, no more than US$300 can be changed into pesos per month at the banks. Fall trips (October & November) offer warm and clear waters for great snorkeling and little chance of strong winds. An added attraction is the opportunity to observe the Baja desert in bloom following the rainy season in August and September. Spring trips (March, April & May) offer warmer waters with warm calm days being common. As an added bonus on spring trips many cetaceans migrate into the Sea of Cortez at this time and sightings may include blue, fin, sperm and humpback whales. Rain gear protects you from rain, wind and the splash while kayaking. It is one of the essential items that all passengers should have no matter what time of year you are traveling. Look for jacket and pants that are 100% waterproof, not just water resistant. A hooded jacket is recommended as well as good secure closures around your head, neck, wrists and ankles. Do not bring a rain poncho as it cannot be worn under your PFD. You can either bring your own sleeping bag and pad or you can rent them from us. You may want to bring a pillow or small, empty stuff sac to put clothes into at night. Gear you do not want to bring on the trip can be transferred from Loreto to La Paz by our staff. Plan to have an extra bag dedicated for these items. We recommend that you leave your valuables at home. While on the trip you can store your passport, wallet and other items in your duffel. Under most circumstances, if you are of an adventurous spirit and in reasonably good health, you should have no problem enjoying an O.A.R.S. International, Inc. People with medical conditions, including pregnancy, should have a physician’s approval before taking an adventure travel trip. Everyone is required to sign a standard liability release form before the trip, acknowledging awareness that there are inherent risks associated with the Due to the nature of the activities, a condition of your participation is that you will sign this form and return it to our office before the trip begins. Anyone who refuses to sign the form will not be allowed to participate, and consistent with O.A.R.S. International, Inc. cancellation policy, there will be no refund of the trip fees at that time.